Keeping it short & sweet today - had a migraine yesterday so my little 'ol brain is feeling a tad delicate. 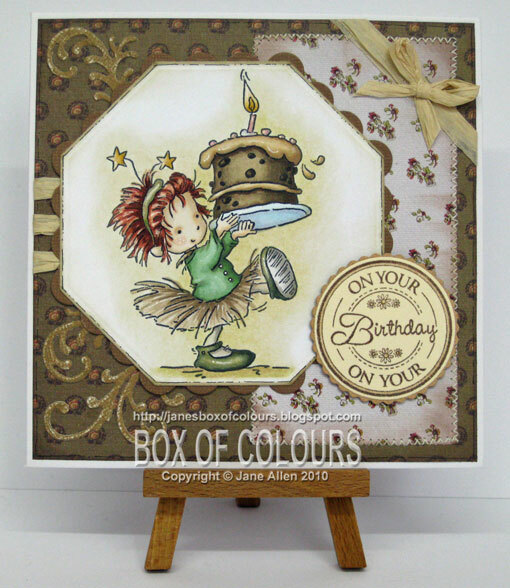 This adorable stamp is by Lili of the Valley as is the sentiment. Oh dear, I feel the urge to splurge coming on, hubby best lock up the CC!!!! By the way - it was a hit with MIL - brownie points to me! Additional: Raffia, Marianne D die, Nestabilities, sewing machine. Oh goodness, this is so sweet. I don'tknow what you feel you got carried away with- I think it's perfect. :) Love the colors, the papers and embellishments, all of it! I think this card is my favorite so far. I like driving in my car! Don't twy thish at 'ome 'coz it hurtzzz!!! A Pirates life for me!